John Vechey replaces David Roberts, and promises to refocus on new IP. PopCap's David Roberts will retire, effective this Wednesday, and will be replaced as CEO by co-founder John Vechey. 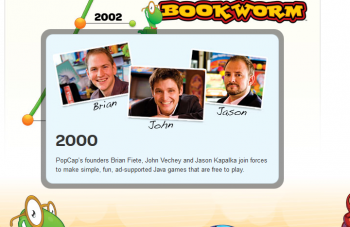 Jason Kapalka, another co-founder, will leave at the same time Roberts walks out the door, which leaves Vechey as the sole remaining PopCap founder. Though Kapalka will keep in touch as a PopCap creative consultant, there's no word yet on what nine year PopCap veteran Roberts intends to do with his free time. "We wish Dave all the best," says Vechey. "He has made a huge mark on PopCap, and we thank deeply him for it as he embraces his new adventure - which will probably consist of doing very little for a while!" Vechey went on to say that one of PopCap's new priorities, under his management, will be to invest in new IP. Vechey describes PopCap's new mission as "to create the greatest mobile game studio in the world," and to make that happen, PopCap needs new hits. PopCap's still making money, but it had a pretty rough time in 2013. Its outlets in Vancouver and Dublin shut down - Plants vs Zombies creator George Fan was among those let go - leading some to wonder whether EA's $750 million purchase was a prelude to disaster. At the time, Vechey tried to make himself the spokesman, saying that the layoffs were "100 per cent made by us, with no pressure from EA," but later statements by EA's Frank Gibeau seemed to contradict that. Good luck to Vechey, in his quest to turn PopCap into the greatest mobile studio in the world. He may need it.